Mehendi is the art of painting the hands with henna patterns from the special (I want to emphasize that the henna used is special, but not one that is sold in stores for coloring the hair). Henna is a great way to decorate your body! First, it is completely safe and absolutely painless procedure (henna is a substance of plant origin). Second, the pattern remains on the body for about two weeks (on the one hand, no time to get bored, on the other hand, allows a person who wants a permanent tattoo, to make a final decision). Thirdly, it is inexpensive and quick to apply. The best solution is to make the mehendi before going on vacation. Two weeks later you come in with a dark figure, and when he will gradually come down, already formed by the time the sun will remain white pattern! 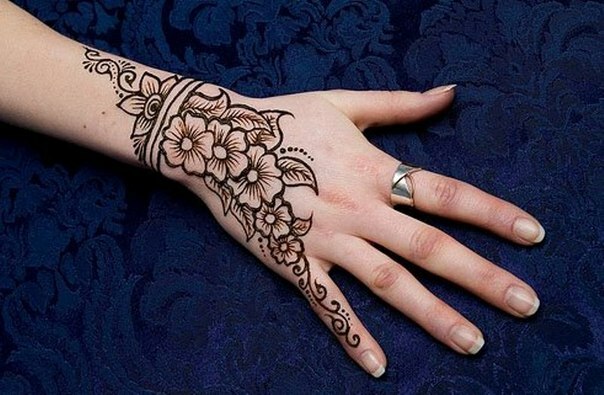 There is a perception that henna came to India. But most likely, it got there only in the 12th century. In this country, and now widespread henna painting. On the street, for a penny you can apply a beautiful pattern. Mehendi is able to surprise people only here there is in order. Most likely, the art of painting with henna originated in Ancient Egypt. Traditionally, the pattern is a thin metal or wooden stick, also can use a brush, syringe-bag or ready-made henna in a tube. Patterns are applied by hand and stencil. After applying the paint needs 6-8 hours to dry. At this time, it is desirable to wet with water, it would be ideal if to give the resulting crust to go. Also preferably after drying of the paste several times to wet the pattern with a special oil for mehndi or sprinkle with lemon juice. In this case, the image will be brighter and stay longer. Do not worry that the picture immediately after applying the bright orange. After 24-48 hours, the pattern will be the usual dark brown color. Apply mehendi can be anywhere – arms, legs, shoulders, back, tummy. In short, it all depends on your personal preference. Hold the figure about three weeks, all depends on space and how often he falls under the water. As you can guess, hand mehndi is washed off the fastest. If the picture is faded or tired, just reportes in the tub, RUB it a sponge – and you are free! • Do not wash the figure for at least 8 hours after application. Ideally, the mehendi is applied in the evening and go to sleep with him. • The next day, RUB into the pattern of mustard or almond oil. • Before taking a shower it is advisable to wipe again drawing any oil. Figure it is better not soap and do not RUB, just rinse with water. And remember – do not be upset if your favorite pattern has faded or even gone. It can always be done again!